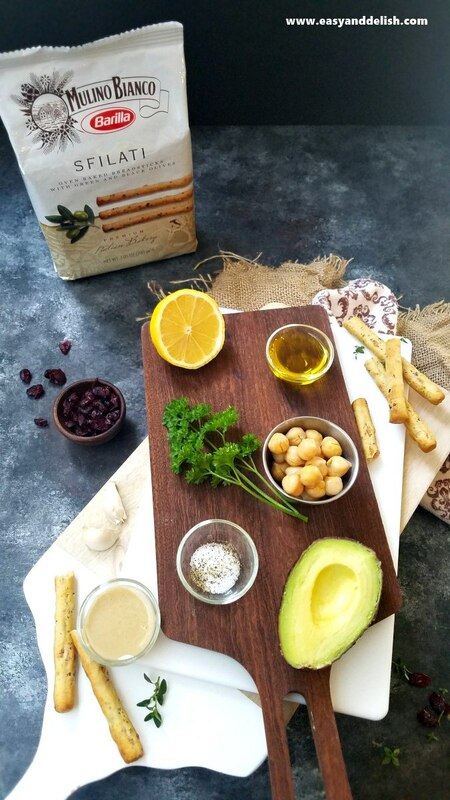 Avocado Cranberry Hummus Dip is a no cooking, quick and easy appetizer made with a few simple ingredients, and served with olive breadsticks. It’s perfect for the Holidays! The holiday season is on! Yay!!! And along with it comes food, of course… and the best eats are handy and tasty, right?! 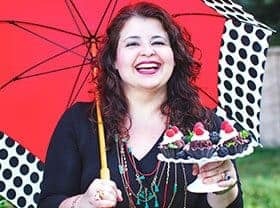 They don’t have to be heavy in order to be delicious. This quick and easy Avocado Cranberry Hummus Dip will blow your mind — it’s festive, requires no cooking, and is a real crowd-pleaser. Excited? Now, please raise your hand if you are crazy for hummus. Both of mine are raised and waving!!! Yep, yep! How about avocado and dried cranberries? Yes… my mouth is watering! 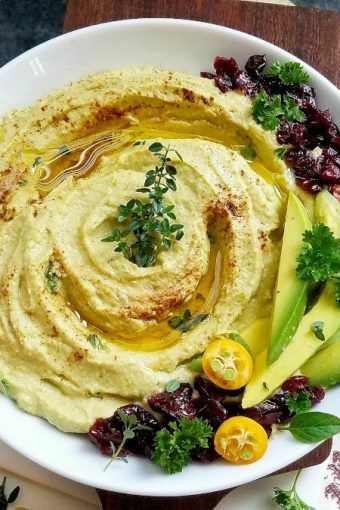 Our hummus follows the same concept as the classic gluten-free Levantine dip or spread prepared with garbanzo beans. It is made with tahini (sesame seed) paste, lemon juice, seasonings, garlic, and olive oil. The addition of avocado is the twist! And that’s not all. Our appetizer is topped with dried cranberries, which gives the dip a Christmasy touch, while adding a sweet-sour flavor that contrasts so well with the savory taste of the hummus. It is served with Italian Mulino Bianco breadsticks — available in two delicious and savory flavors, Sfilati Tomato and Sfilati Olives. We served our hummus with the latter! These breadsticks add a wonderful crunch that contrasts with the creaminess of the dip. Since 1877, Mulino Bianco has been perfecting its recipe for each product, always maintaining the same standards of high quality for all of them. 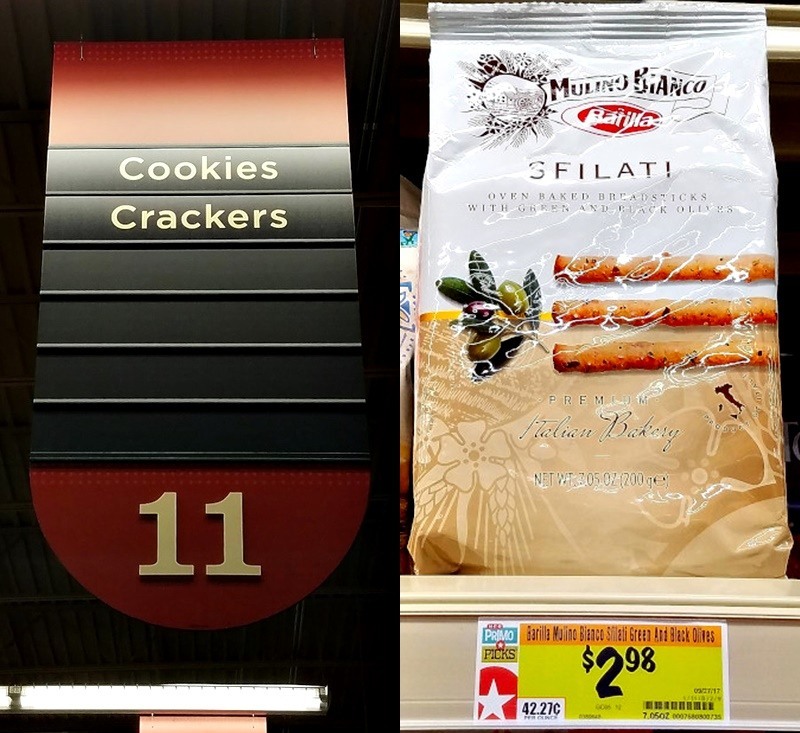 Because as you may know, when it comes to food, Italians are particularly demanding about products, ingredients, and flavors– no matter whether it is dinner, a simple snack or an appetizer. Every meal is equally important! Another bit of good news is that we don’t have to travel to Italy to find these breadsticks. They are conveniently available at an HEB near you, as well as all of the other ingredients used in our Avocado Cranberry Hummus Dip. 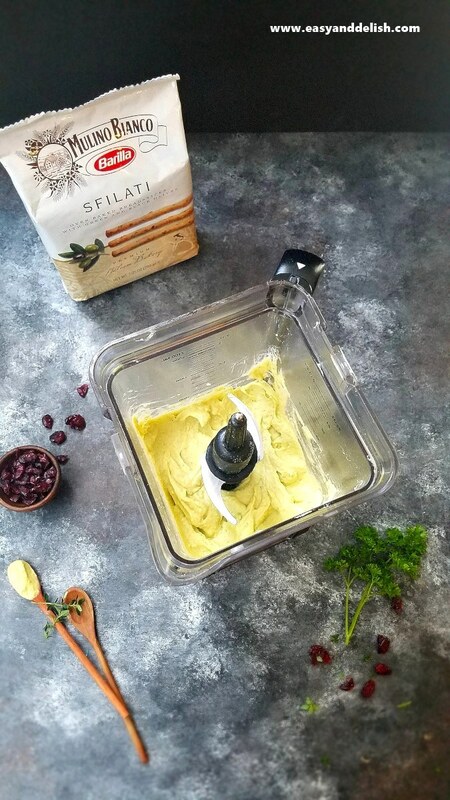 To prepare our dip, all we have to do is blend canned chickpeas or garbanzo beans, avocado, tahini paste (optional), garlic, salt, ground pepper and cumin, lemon juice, olive oil, and parsley in a blender until creamy and smooth. Then, place mixture into a serving bowl and serve with the Mulino Bianco Sfilati Olive breasticks. Voila! Could any appetizer be easier than that? For more yummy holiday recipes like ours, visit the Mulino Bianco website. There you can also obtain more info about their other products as well, and locate them at a local store near you. You can even access and print a coupon to save on your Mulino Bianco breadsticks purchase. How exciting!!! 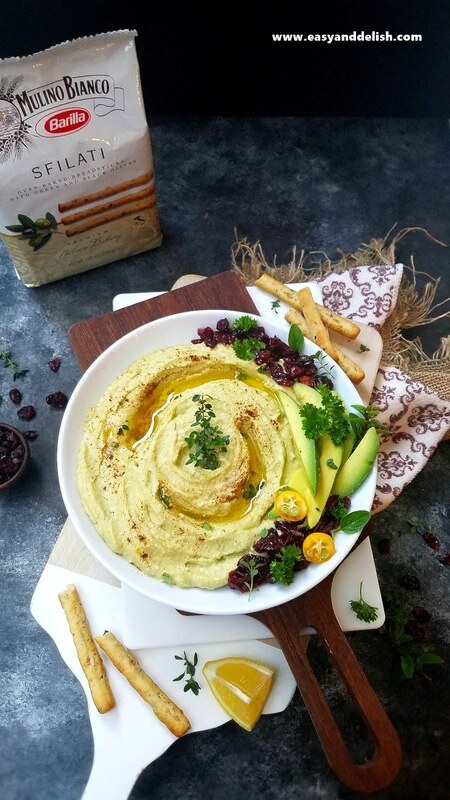 Well, continue to enjoy the best time of the year, along with our tasty and festive Avocado Cranberry Hummus Dip. Place all ingredients (except cranberries and breadsticks) into a blender, including the reserved liquid from the canned chickpeas. Blend all until creamy and smooth. Spoon hummus into a serving bowl. Drizzle a bit of olive oil on top. Then, garnish with dried cranberries on the side and parsley leaves. 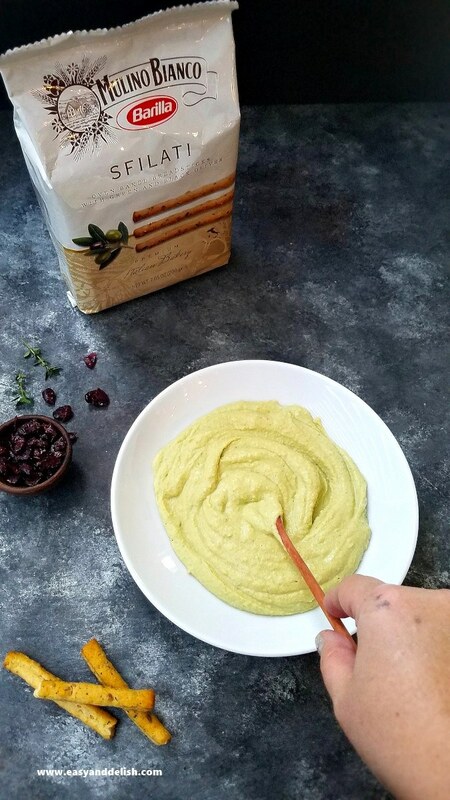 Serve Avocado Cranberry Hummus with the breadsticks and enjoy! Storage: Hummus must be stored in a clean airtight container in the refrigerator. What a stellar appetizer! This dip would also make a splendid spread for a vegan sandwich. Topped with lots of veggies for a healthy meal during the holidays. Mmmm, avocado! And mixed with cranberry and hummus? Sold! Terrific recipe — thanks. Love your symphony ! Thank you dear Denise ! This is my type of dip! Excellent post our dearest Denise! Sending you our love (and lots of hugs)!